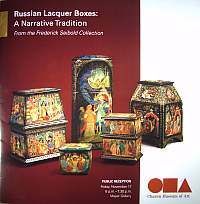 This is a 13-page full-color catalogue from the Russian Lacquer box Exhibition that was held at the Chazen Museum of Art in Madison Wisconsin in late 2006, early 2007. The catalog gives a brief overview of the art form and three of the four villages that are known for it (Palekh, Kholui and Mstera). Following this, are 10 pages of specific boxes that appeared in this show, including 11 photos of the boxes. As a footnote, a number of boxes in this exhibition were done by artists, who have had works on our website in the past, including A. Kochupalov, S. Makarova, V. Terentiev, S. Dmitriev, V. Bogdanov and others. Very limited supply!